There are medical conditions that cause fatigue but there are lifestyle factors such as lack of sleep, poor diet and stress that leave you without fuel to finish the day. There are a number of products to give a boost of energy when you need it. Most energy supplements come in capsule form but there are also gels, powder drinks, teas and chewables to choose from. Here is a short list of ingredients commonly found in energy supplements to help you make the best choice when needing a pick-me-up. Rhodiola rosea is a natural ingredient in energy supplement Energy Kare that gives mental alertness without the crash that caffeine products can have. Ginsing is from the ginseng root that's controlled by the Korean government. Ginseng has natural energy boosting properties and is used to combat cancer-related fatigue. Vitamin B-12 converts the food you eat into glucose which in turn helps keep you energized, improve mood and concentration. No wonder unchecked vitamin B-12 deficiency can lead to deep fatigue and even mood changes. Bolt Organic Energy Chews contain vitamin B-12 along with important electrolytes, antioxidants, complex carbohydrates and caffeine from Yerba Mate for fast fuel. The chews also provide a convenient packaging to keep in a purse or bag to have available when you need that energy boost. Green Tea not only wakes you up with its caffeine, but it won't give you the jitters since it has less caffeine than coffee. It also has health benefits with its amino acid L-theanine that helps with brain function and the ability to focus. 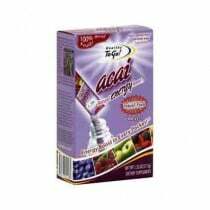 Acai found in Acai Energy Boost Powder is a super food rich in antioxidants and is an energy-boosting fruit. This powder drink also has important B vitamins.